2014, Main Street Rag Publishing Co. There is nothing quite so heartbreaking as the death of a child, nothing more cruel than a parent surviving his or her own offspring. The tension between the fragile hope and joy of children and the finality of death is potent throughout the sixteen poems that make up Elisa Albo’s new collection, Each Day More..
From the opening title poem, an elegy for Alexander Standiford, a young man who died at eighteen, way too young, to “Hurricane Sandy,” a poem about two boys swept away from their mother to their deaths, at Staten Island, to several poems involving two young people, the poet’s cousins, Janet and Robert, killed in a Florida motorcycle accident, these poems ooze with the pointless tragedy of young death, including the anonymous deaths of the boy-soldiers in Iraq and the Middle East. My husband says perfection is a sensation. a space into which we can pour happiness. This brings to mind that fundamental American aspiration, the “pursuit of happiness.” Is it really just bunk? Elusive, unattainable? What does it even mean, to be “happy”? Precious as a small child; a gift, not a right. our great aunts. Tap-tap. Two gone. Albo alludes here to the Jewish tradition of naming newborns after deceased relatives in order to preserve their memories and provide a sense of continuity in life. water, I keep a close eye. a young wife an infant son. 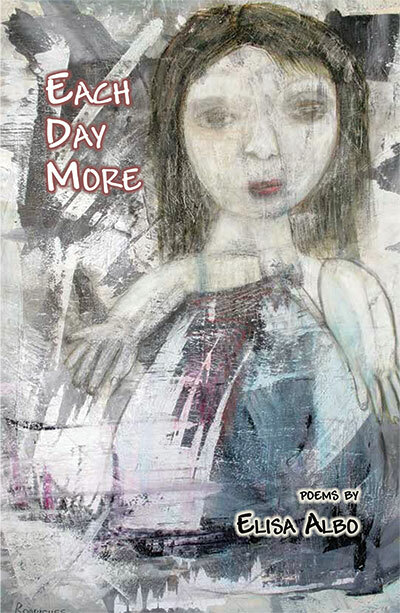 The poems in Each Day More are somber, but they are wise, as in the reflections Albo writes in poems like “Tap-Tap” and “First Day of Summer, 2006.” The spare, evocative lines also provide their own sense of solace by the sheer artfulness and gentle reflection with which they are written. As the very title of the collection suggests, a fullness of experience is achieved in time, and though “experience” often equals “loss” and “pain,” it’s what we accrue, what we hoard; it’s what we have to hang onto.